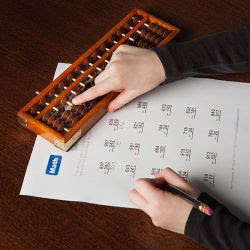 Abacus, a counting instrument has been well known for providing huge benefits to children. Apart from being used as a brain development tool, it is more popular for being an aid to enhance the mathematical abilities in kids. Abacus has become adaptable because of its simplicity and use. Let us take a look on how Abacus can be used in Problem Solving. The fundamental of having effective problem solving skills is that an individual is able to perform basic mathematical operations like addition, subtraction, multiplication and division without difficulties. Abacus assists the user to become perfect in these operations, through speed and accuracy thus making the pathway to problem solving smooth. Also, skills like visualization, memorizing and recalling, which is the outcome of Abacus training, adds to enhanced problem solving abilities. Good problem solving skills facilitate in minimizing the math pressure and improve academic performance. This ultimately reduces the aversion of mathematics in children and encourages them to excel in it. Abacus classes are in huge demand these days, but it is important that you take the right one. Opt for the Abacus course at Master Mind and learn mental maths skills to solve problems easily.